(Left to right) Ambassador of Guyana toBrazil, H.E George Talbot, Director General, Ministry of Foreign Affairs, Mrs. Audrey Jardine-Waddell, Senator of the State of Roraima, Romero Jucá, Vice President and Minister of Foreign Affairs, the Honourable Carl B. Greenidge, Minister of Foreign Affairs of the Federative Republic of Brazil, the Honourable Aloysio Nunes Ferreira Filho and Ambassador of Brazil to Guyana, H.E. Lineu Pupo de Paula. Preparatory work continues apace for start of construction of the Linden-Lethem road which will link Guyana with neighbouring Brazil later this year, officials said. 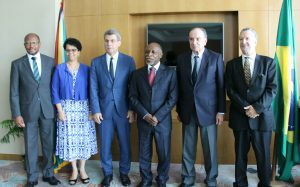 Foreign Affairs Minister, Carl Greenidge said the status of the decades-long promised bridge was discussed with Brazil’s Minister of External Relations, Aloysio Nunes Ferreira’s one-day visit to Guyana on Thursday. Greenidge said technical teams from both countries would meet to examine terms of reference for consultancies to do the final design of the road. “You have to have a final design and that is the work of consultants that the two sides will decide on and they have to be given terms of reference,” he said. Construction of Phase One-Linden to Mabura-. Greenidge said, would begin during the last quarter of 2018 and would be financed by the United Kingdom to the amount of 150 million pounds sterling. Funds for Phase Two- Kurupukari to Lethem- would be provided by either the Inter-American Development Bank and China. Construction, he said, might begin in late 2019. The Ministry of Foreign Affairs, in a statement, later quoted Minister of Public Infrastructure, David Patterson as saying that the terms of reference for the Linden to Lethem road project will be ready by August of this month. “One of the main purposes of the meeting is to ensure it remains a priority for both States. Therefore, by bringing such a large delegation, Brazil shows that they are as committed as we are to see this project through,” Minister Patterson said. Phase one of the project covers approximately 125 kilometres of the road (Linden to Mabura Hill) and also includes a bridge across the Kurupukari River. The Guyanese foreign ministry said Greenidge and Nunes Ferreira discussed areas of mutual interest, including the ongoing talks on the Linden to Lethem road link, the International Road Transport Agreement (IRTA), and trade and investment matters. Earlier in the day, the Brazilian External Relations Minister paid a courtesy call on President David Granger. He departed for Brazil early this afternoon. This year marks the 50th anniversary of the establishment of diplomatic relations between the two countries. The delegations also discussed planned activities to celebrate the occasion.